Dream Profits found at dreamprofits.co promises to make you $4250 every single day like a clockwork, but don’t be fooled. Dream Profits is a scam. Protect your hard-earned money and read our detailed Dream Profits review to find out the loop holes in this scam! Dream Profits, an automated trading software hailed as the holy grail of getting rich online, is taking things as far as it can when it comes to telling lies. 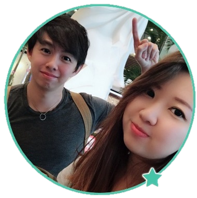 As soon as you enter the webpage, you’ll be introduced to the big headline that claims each of Dream Profits members made over $150.000 with the software. And now, you are one of the lucky 15 members who will be able to get your hands on the very same software. What’s more, the slots are open for TODAY ONLY! What a coincidence that is, right? To authenticate Matthew’s claim, we decided to look for whois information of the website, which lists the date where a particular website went online. As you can see from the whois information above, the website for Dream Profits scam, dreamprofits.co has been around since the end of March 2016, 19 days before this review was written. For the past 19 days, the same video has been played over and over, and the exact same promise has been repeated to thousands of viewers. Every single one of these viewers were told that they will be one of the lucky 15 members, and that the slots will only be opened for the day itself. Obviously, it’s just a tactic used by the scammers to force its victims into impulse sign up, without giving them enough time to properly analyze the scam. The website will be around for as long as there are victims, and the same lies will be told over and over again. You should have noticed the member profiles shown at the bottom right hand corner of Dream Profits scam webpage while you watch the video. We have collected the rotating member profiles, and compiled them into a single image as you can see above. What caught our attention was the fact that there are two different members with the same name – Anita Klein. Therefore, we decided to begin our investigation by doing a reverse lookup on these two member pictures. 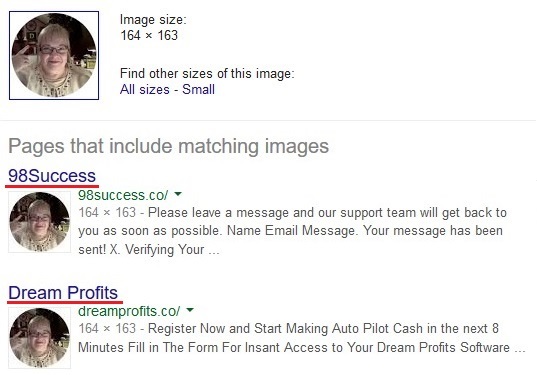 We found that apart from Dream Profits scam, the same pictures were also linked to another notorious binary trading software scam called 98Success. Following this finding, we visited the website of 98Success scam, 98success.co to see where the same photos were featured. What we found wasn’t encouraging, at all. 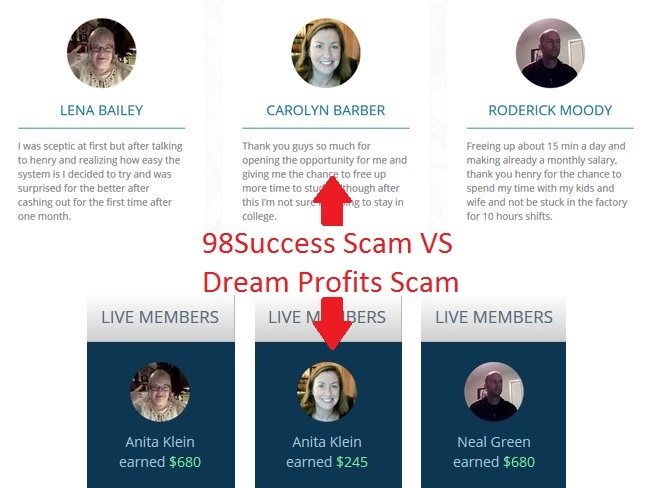 A simple comparison of the “member profiles” in both scam revealed the hidden truth that these two scams are, in fact, using exactly the same photos! However, each of them was given a different identity and name. 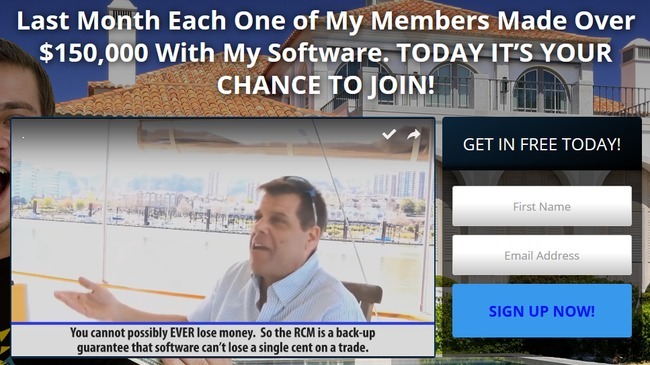 If the members of Dream Profits are indeed genuine people making money from the software, why would they end up having different names and appearing in another binary software scam? Obviously, the scammers behind both scams are the same, and they conveniently use the same set of stolen photos to fabricate their member profiles, hoping no one will find out the details. If you scroll down from the sales video, you would’ve noticed the table that displays Live Trades from Dream Profits software. Don’t focus on the “verified payout” column, because those are nothing more than fake numbers to get you excited about Dream Profits scam. Instead, shift your focus to the dates of trade. Did you notice something is off? The date this review written was on 19 April 2016, and the supposedly “live trades” are frozen on 8 April 2016. Apparently, it’s just a simple table pasted onto the webpage, and the scammers didn’t even bother to update the dates shown for the trades. There is no profitable live trades to be shown for this software, because if you sign up for the software and make your compulsory $250 deposit, you will lose your money in the blink of an eye. That’s how the scammers make money off its victims. Is Dream Profits a Scam? YES, DREAM PROFITS IS A SCAM. We strongly advise you to stay away from the scam if you don’t want to lose your hard-earned money.